HEALTHCARE SCRIM ROAR WIPERS - "RAG ON A ROLL"
People involved in healthcare usually find themselves in frequent need of good healthcare cleaning wipers. "RAG-ON-A-ROLL", or ROAR, are perforated paper wipers that can be thrown away after they are used. This disposable feature makes them the preferred hygienic choice for healthcare, particularly for those in contact with the various fluids that often accompany care for children, patients, and others receiving health care. 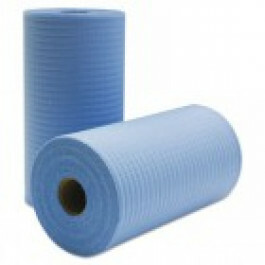 ROAR is available in blue or white, and there are 200 hygienic paper wipes on each roll. These healthcare ROAR rolls are made of four layers of wood pulp fabric combined with scrim nylon mesh. This creates an absorbent scrim paper wipe that is strong enough to use for scrubbing. You can color code their usage, if you wish, with white Rags-On-A-Roll for use on individuals and blue ROAR for use on furniture, floors, and counters. They are excellent for childcare cleaning supplies or as hospital scrim wipers. Try aged care ROAR wipers because of their softness and absorbency. Rag-On-A-Roll is a low linting wiper, and the feel of the wipe is soft enough to be used on patients’ skin. ROAR is a hygienic wiper for healthcare organizations, and as a disposable wipe, is sure to cut down on your laundry bill. Childcare centers schools, aged care facilities, and medical facilities all use ROAR as an economical alternative to cloth towels or regular kitchen paper towels. These healthcare wipers are sturdy enough to finish a job, yet absorbent enough to contain a mess. The result is a cleaner, healthier environment for your charges and employees alike. Try TIDDOX's RAG-ON-A-ROLL with your next order, and you won’t want any other healthcare cloth. Other related products from TIDDOX's healthcare range of cleaning wipes are the WHITE RHINO WIPES-ON-A-ROLL, the SOFT WHITE OMNIWIPE CLOTHS, and the LOW LINT INDUSTRO WIPES.